I've never seen these instore anywhere in the UK, usually have to order them online and so to get them at nearly half price is brilliant! Saw these in the Southport branch on a stand next to the pharmacy, looked pretty new so guessing they've only just come in. Cetaphil Gentle Cleanser cleanses, moisturises and gently removes what your skin doesn't need, without stripping away the skin of natural protective oils or emollients, or without disturbing the skin's natural pH balance. Cetaphil also offers the mildest cleansing available. It allows a gentle and thorough cleansing without the irritation associated with harsh soaps. For many years, Cetaphil is the benchmark for mildness. 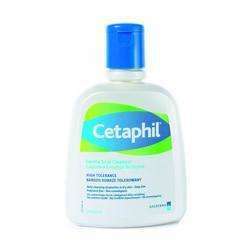 Cetaphil is an effective cleanser for: all skin types including sensitive skins, daily skin care routine to treat the dryness caused by prescription skin care products, even for daily make-up removal, can be used on the face, hands and entire body. Cetaphil Gentle Cleanser: exceptionally soothing with fragrance-free fluid texture, skin friendly pH, non-comedogenic (do not block pores on your skin), non-irritant. What a great find and price....thanks!